추사 김정희 고택의 전래 유물로 추정되는 월성위 김한신 관련유물(10점)과 『신해년책력』(표제1점, 유묵15점)의 김정희 종가 유물 일괄(金正喜 宗家 遺物 一括)은 서예사 연구 자료로 가치가 있다. 김한신의 시집(詩集)으로 13~34세까지의 시작(詩作)을 모은 것이다(총 20면). 다음의 『교사시말』과 함께 김한신의 자필(自筆)로 추정된다. 아직까지 김한신의 문집이 간행되지 않았고 다른 필사본도 보기 어려우므로 아래의 『월성위행장』과 더불어 김한신 관련자료로 가치가 높다. 김한신이 필사한 1747년 7월 12~22일의 일지(日誌)이다(총32면). 아들 김이주(金頤柱)가 기술한 김한신의 행장이다. 글씨는 김이주가 쓴 ‘월성위김한신묘표 음기’와 확연히 다르다는 점에서 타인의 필적으로 여겨진다. 김한신묘표의 제서(題書)로서 영조(英祖)의 어필로 추정된다. 현재 예산의 김한신묘표 앞면에는 “유명조선수록대부월성위…지묘 화순옹주부좌(有明朝鮮綏祿大夫月城尉…之墓 和順翁主祔左)”라 새겨 있고 말미에 작은 글자로 “망칠지년 문체이사(望七之年 抆涕以寫)”라 새겨 있는데, 이 필사물에는 “유명조선(有明朝鮮)”과 말미의 8자가 없다. 유척기(兪拓基, 1691~1767)가 기술한 김한신묘표의 음기로 서자(書者)는 김한신의 아들 김이주(金頤柱)로 여겨진다. 예산의 김한신묘표 음기에는 “불초남이주서 숭정기원후삼신사 월 일립(不肖男頤柱書 崇禎紀元後三辛巳 月 日立)”이라 새겨 있어 김이주가 쓰고 1761년(영조 37)에 세웠음을 밝혔다. 묘표 글씨와 이 필사물의 서풍은 같으나 자형이 다른 예가 있으며, “일행(一行)ㆍ이행(二行)ㆍ삼행(三行)…”이라 각행의 순서를 표시한 점으로 보아 김이주가 필사한 다른 부본(副本)일 것이다. 1758년(영조 34) 3월 15일에 영조가 호상중관 이세태(護喪中官 李世泰)로 하여금 둘째 따님 화순옹주의 영전에 바치게 한 제문이다. 서자(書者)는 미상이다. 김정희가 사용했던 『신해년책력』 앞표지에는 “신해칠정(辛亥桼正)”이란 제목과 “길상여의관(吉羊如意館)”이란 소장처가 예서로 쓰여 있다. 책력 제1면의 “대청함풍원년 세차신해 칠정경위 숙도오성 복견목록(大淸咸豊元年 歲次辛亥 七政經緯 宿度五星 伏見目錄)”으로 보아 “신해칠정(辛亥桼正)”은 “신해칠정(辛亥七政)”의 뜻임을 알 수 있다. 함풍원년은 1851년(철종 2)에 해당된다. 이 책력에는 시고(詩稿)ㆍ서간(書簡)ㆍ제서(題書)ㆍ임서(臨書) 등 김정희의 필적 17점이 붙어 있는데, 지정대상은 이 중 ‘해서대련’과 ‘전서’를 제외한 15점에 한한다. 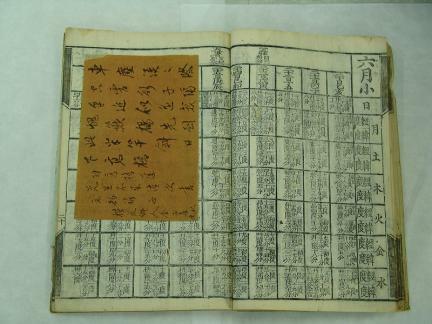 This group of relics, believed to be part of the heirloom of Kim Jeong-hui’s family, includes artifacts related to Kim Han-sin (ten items) and the almanac of the year Sinhae (Sinhaenyeon chaengnyeok; one calligraphed title and fifteen autographs). These items shed important light on the history of Korean calligraphy. ㅇ Relics related to Kim Han-sin - Maeheon nango: This collection of poetry by Kim Han-sin contains poems written by him between the ages thirteen and thirty-four (twenty pages in total). The texts appear to be autographs by Kim Han-sin, as is the case with Gyosasimal listed below. This collection of poetry is highly valued, along with Wolseong wihaengjang listed further down, for insights it offers into the life and work of Kim Han-sin, as no literary works of his had never been published, and manuscripts by him are also extremely rare. – Gyosasimal: This document is the personal journal of Kim Han-sin, covering the eleven-day period between July 12 and 22, 1747 (thirty-two pages). - Wolseongwi haengjang: This text contains the life story of Kim Han-sin and was written by his son Kim I-ju. The handwriting, however, shows obvious differences from the one in ‘Wolseongwi Kim Han-sin myopyo eumgi,’ presumed to be an autograph of Kim I-ju. This text is, therefore, likely to have been penned by the hand of a person other than its author. - Yeongjoeopil Wolseongwi Kim Han-sin myopyo: This is the original text on which the epigraph on the front side of Kim Han-sin’s grave post was based and is presumed to have been penned by King Yeongjo. The text, however, is slightly different from the epigraph. 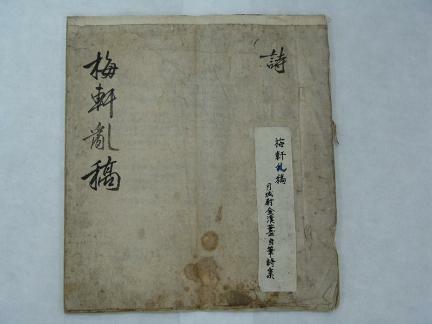 “Mangchiljinyeon muncheisa (望七之年 抆涕以寫),” written in small characters at the end of the inscription, is missing in this text. -Wolseongwi Kim Han-sin myopyo eumgi: This is the text of the epigraph found on the back side of Kim Han-sin’s grave post. 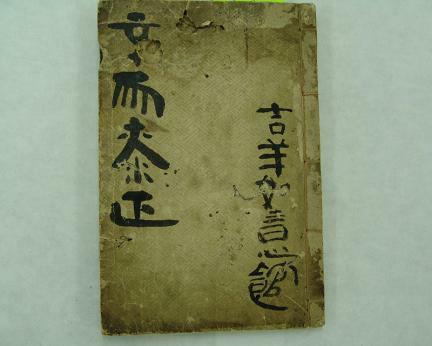 It was authored by Yu Cheok-gi (1691-1767), and the handwriting is believed to belong to Kim Han-sin’s son Kim I-ju. The inscription reports that the grave post was erected in 1761 (37th year of King Yeongjo’s reign), identifying the calligrapher as Kim I-ju. While the epigraph is overall identical to this text in calligraphic style, some of the characters look quite different. This text also has notes indicating the order of lines for each character. It is, therefore, likely that there existed more than one calligraphic copies of this text, and that the one used for the engraving was a different copy. - Yeongjoeoje Hwasunongju yujemun: This document contains the memorial oration composed by King Yeongjo for his late daughter Hwasun ongju. 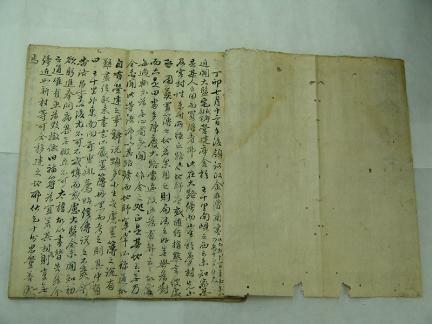 The text was read at the altar by Yi Se-tae on March 15, 1758 (34th year of King Yeongjo’s reign). The identity of the calligrapher is unknown. 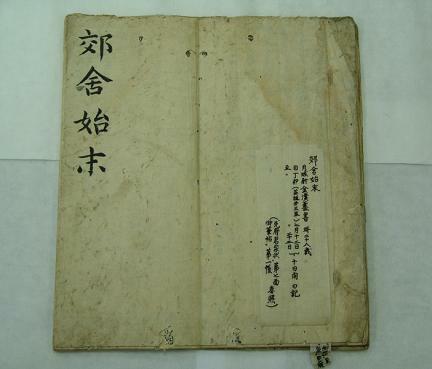 - Sukbin Choissi sichaekmun: This document contains a statement made by King Yeongjo’s in 1756 (32nd year of King Yeongjo’s reign), on the occasion of bestowing a posthumous title on his late mother Sukbin Lady Choi (1670-1718). The statement was taken down in writing by Kim Han-sin (eight folded pages). - Yeongjoeopil chunchuk– Indian ink on paper - Yeongjoeojeeopil huiu – Seven-word quatrain, Indian ink on paper - Yeongjoeojeeopil chiljeol – Indian ink on paper ㅇ Kim Jeong-hui’s autographs inside Sinhaenyeon chaengnyeok: On the cover of the personal copy of Sinhaenyeon chaengnyeok, an almanac of 1851, that Kim Jeong-hui used, the title “Sinhaechiljeong” is written, along with “Gilsangyeouigwan,” the location where it was held, in clerical script. The phrase “Daecheonghampungwonnyeon sechasinhae chiljeonggyeongwi sukdooseong bokgyeonmongnok(大淸咸豊元年 歲次辛亥 七政經緯 宿度五星 伏見目錄),” found on the first page of the almanac suggests that “Sinhaechiljeong,” although written as “辛亥桼正,” should be understood as “辛亥七政.” Hampungwonnyeon corresponds to 1851(2nd year of King Cheoljong’s reign). Inside this almanac are seventeen autographs by Kim Jeong-hui, including manuscripts of poems, letters, titles and writings based on models of calligraphy. Fifteen of them, excluding the daeryeon calligraphy in regular script and the seal script writing, are included in this group of items together designated as a Treasure.